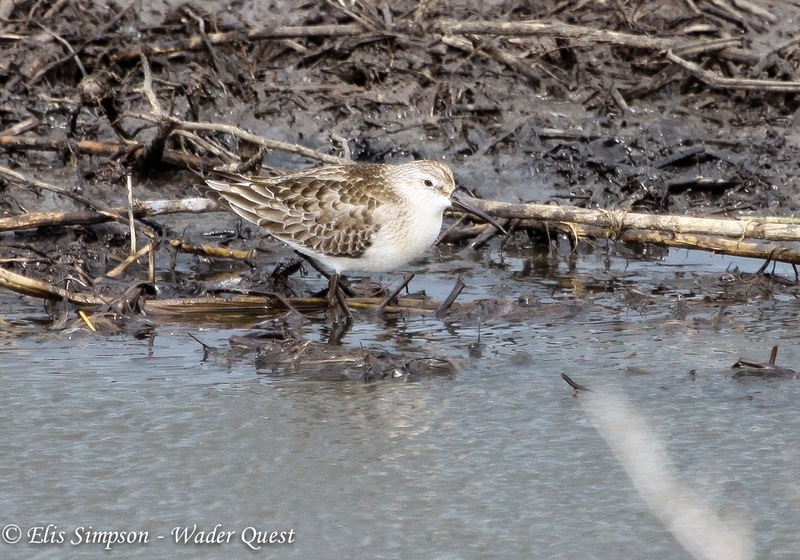 Wader Quest: Great Knots and Bar-tailed Godwits with satellite transmitters in the East Asian-Australasian Flyway. Great Knots and Bar-tailed Godwits with satellite transmitters in the East Asian-Australasian Flyway. Chris Hassell who is based in Broome in Western Australia reports that a number of Great Knots and Bar-tailed Godwits have had satellite transmitters attached to them to track their migration movements in the coming year for the EAAF satellite transmitter project being carried out by him, Ginny Chan, Lee Tibbitts and Theunis Piersma. 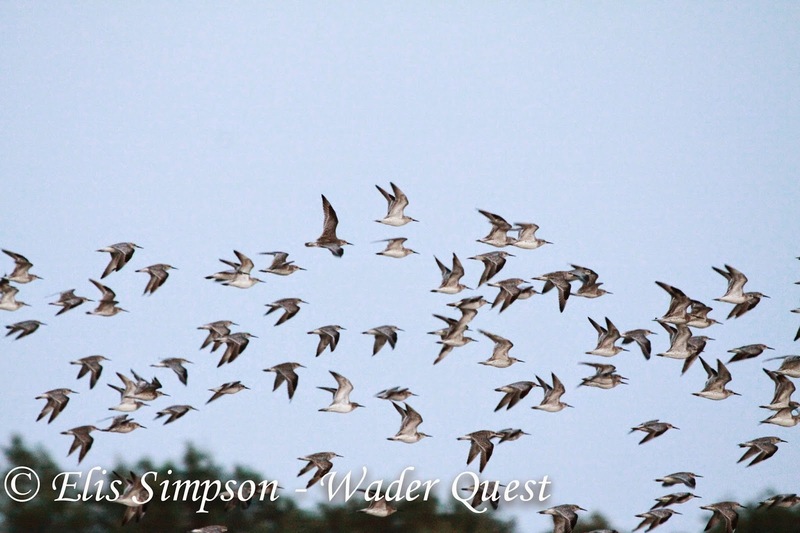 Sufficient numbers of Great Knot were caught on 22/10/2014 for the project's needs. 20 individuals were held in captivity to be part of a 'personality experiment' which follows Bijlveld's paper looking at the relationship between personality, physiology and survival in Red Knots. These birds were later released and their movements monitored. Great Knot Calidris tenuirostris, Broome, Western Australia, Australia. On the 29th of October Bar-tailed Godwits were captured, transmitters were attached and the birds were released immediately, they were not to take part in the behavioural experiment being less easy to keep in captivity than Great Knots. Bar-tailed Godwits Limosa lapponica and Great Knots Calidris tenuirostris, Broome, Western Australia, Australia. As a by-catch of the desired Bar-tailed Godwits some other species were captured which revealed some interesting age related statistics. When a bird is caught and first ringed as an adult, it is not possible to age them precisely at that time, so where this occurs when the bird is recaptured the ringers are only able to give a minimum age for the individual as its age at first capture was unknown. These birds are then aged as, for example, 10+. One Red Knot that was captured proved to be 16+ years old and a Curlew Sandpiper was aged at 13 years (presumably originally ringed in its first year). Of the Great Knots the oldest was 19+ years old with other old timers at 18+, 16+, 15+, 14 and 12+ with another at 13 years of age which had a transmitter attached. Curlew Sandpiper Calidris ferrunigea, Melbourne, Victoria, Australia. The elderly godwits included one at 19+ which had a transmitter attached and another at 14 years old. A Pied Oystercatcher was aged at 15 years old. Pied Oystercatcher Haematopus longirostris, Broome, Western Australia, Australia. The birds carrying transmitters have already surprised the researchers. One Great Knot moved 165km south and then a couple of days ago a further 50km south along the beach. A second Great Knot took off and in one flight ended up 912km to the east, but its transmitter showed that it stuck to the coast so the actual flight was more like 1,000km. Great Knots Calidris tenuirostris. Pak Thale, Petchaburi, Thailand. The godwits moved less dramatically moving only 30km south. Bar-tailed Godwits Limosa lapponica, Broome, Western Australia, Australia. It will be interesting to see where these birds go, and when and where they return to next year. If anyone sights a bird with a transmitter along the EAAF they are encouraged to report it to the team.